Recently, Crooker Construction provided local elementary students a special opportunity to get up close and personal with our heavy machinery. The students had a blast learning about the ins and outs of not only the equipment, but the industry in general. After nearly 79 years of ownership under Harry, Frank and Ted Crooker, the company Harry C. Crooker & Sons has been sold. 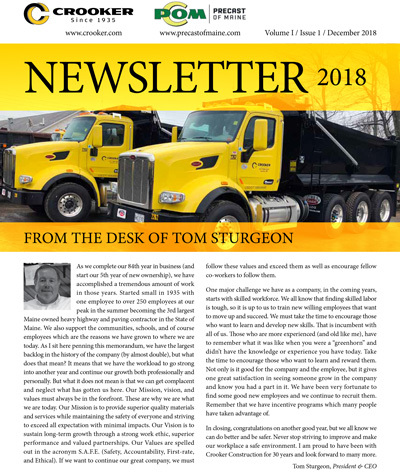 The company remains locally owned and operated while retaining all of the employees and the management team, led by Thomas C. Sturgeon, President and CEO. The company will continue to provide the high quality engineering, construction and paving services it has always been noted for. The company remains committed to supporting the State of Maine and all of the local communities it operates in.